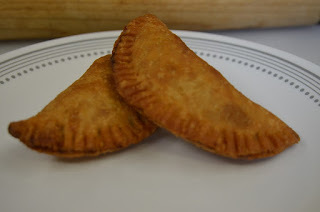 If you are looking for something quick and easy for dinner tonight, you are in luck. 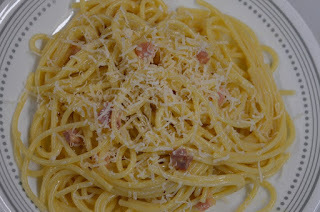 Today is International Carbonara Day. 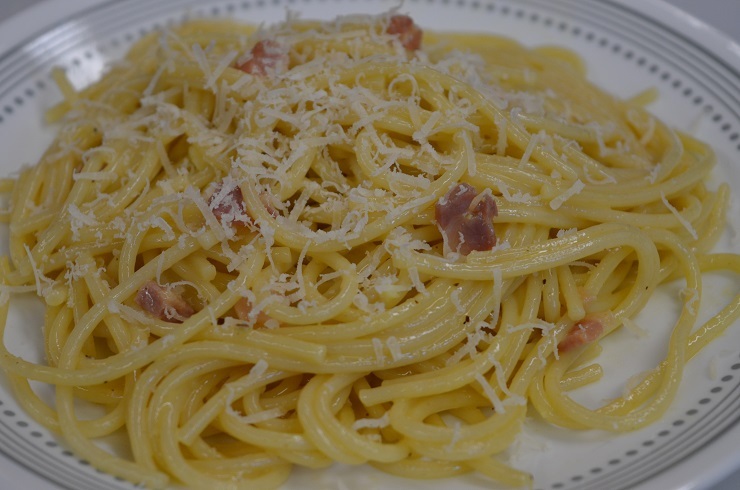 Carbonara is probably one of the easiest meals I've ever made. As a matter of fact I made it for lunch today in honor of the holiday. The garlic is an American addition to the dish. 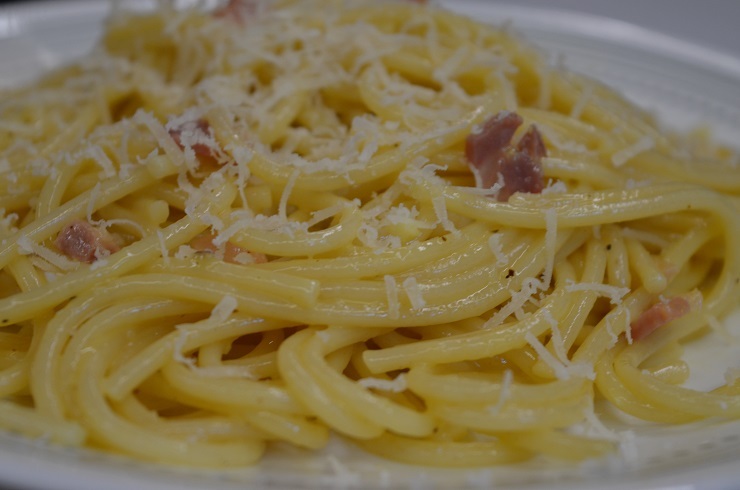 In Italy the garlic is rarely, if ever used in this dish. Put on 4 qts salted water on to boil for spaghetti. In a mixing bowl, whisk together eggs, egg yolks, cheese, and pepper. In a large skillet over medium heat add Olive oil, and pancetta. 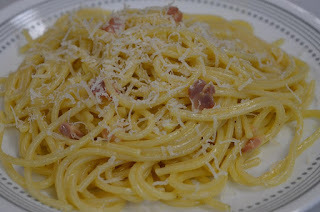 Cook until pancetta starts to crisp on edges, 1 - 2 minutes. Add garlic (optional) to pan of pancetta and cook until aromatic, about 1 minute. Remove pan from heat. Boil spaghetti according to directions to al dente. Place colander in a large metal bowl and strain spaghetti in colander catching past water in bowl. (this heats the bowl to keep the carbonara hot.) Reserve about 1 cup of the pasta water. Add drained spaghetti to pan of pancetta and return to low heat, mixing ingredients, about 1 minute. Empty water from mixing bowl, transfer spaghetti to bowl, add egg and cheese mixture. Mix well, salt and pepper to taste. If needed, add some of the reserved pasta water to make it creamier. 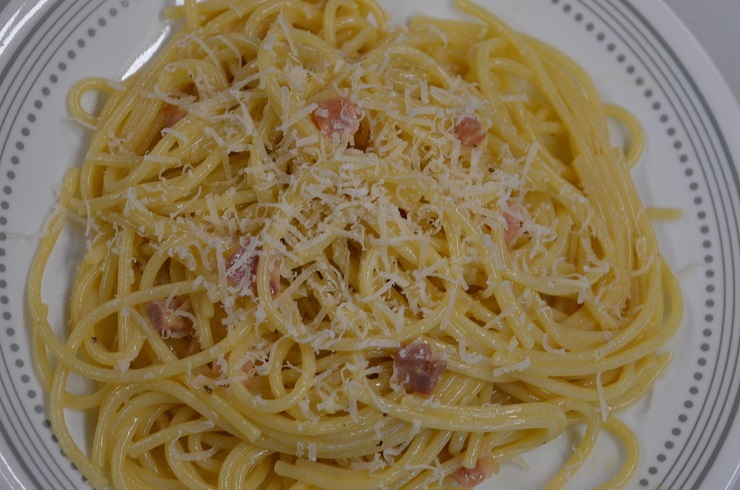 Top with freshly grated parmesan cheese, serve immediately.